...and neglecting my blog, that's for sure! I got the little doll sized quilt done for the swap, I wanted to get it done before anything else could come up and put pressure on me. This is what I gleaned from my partner's Flickr favorites and her blog and her list of likes and dislikes- I hope she likes it. It measures about 24" x 18, roughly. The little blocks finish at 2.5". I thought it needed some life and color so I appliqued on some birds made out of fabric scraps. I'm pretty pleased with how it turned out. Then I decided to make another little one- this one is a beach scene that reminds me so much of our times at the beach house which is owned by our friends, Katie and Patrick. It's in FL and we have so much fun when we go down there. Like someone said when they were helping our visiting friends find the house- "it's always a party at 1610!" I might be sending this quilt off to someone if their partner flakes out and fails to come through as prearranged, but I sure hope I get to keep it, I really like it! This is heavily appliqued and the back looks like a line drawing of all the detail on the front, it's very cool looking. There are several 3D features on this little quilt, which measures about 13" x 12". 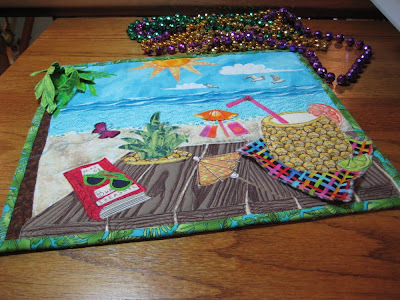 The palm tree leaves, the napkin under the drink, the beach towels and umbrella all stick out somewhat, giving it lots of dimension. 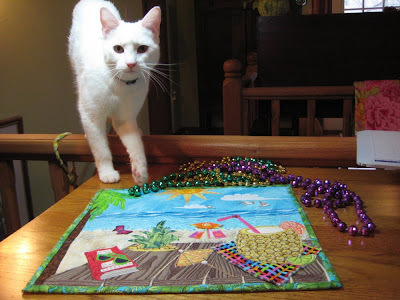 Nosey Parker felt the need to help arrange the noisy beads as I was setting up the photo shoot. Then I realized it wasn't done, I hadn't put on the 2 cool leaves! Eeeek. I've also been making string blocks for another quilt along. This is so much fun! Bright, aren't they? :) I'm having a ball laying these out, finessing the layout only to have a renegade kitten come flying thru and rearrange them all for me. I finally took a photo so I could remember where I had them. Twist one block and the whole design goes wrong! 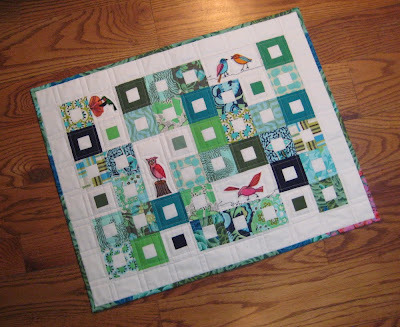 This quilt along design incorporates several different kinds of blocks together- the strings like the above photo shows and some Crazy 9 Patch blocks, and some pieced and appliqued circles. I made 13 of these Crazy 9's but didn't like them too much as I messed them up a bit. (The top one in the photo below- see how the middles are much bigger than the corner bits?) That was really bugging me and it was only going to get worse when I sewed the blocks together to each other. So I "fixed" them by adding in strips of black. I cut an inch out of the middle of the block in one direction first, added a 1" black strip, then cut them again and added another black strip going the other way. That made the trouble areas smaller, perfect! I was happy to have found a solution that worked. So that's what I've been doing- sewing, pondering, planning and plotting and scheming.... And I'm having a lot of fun hanging out at the DQS8 Flickr group and seeing all the little lovelies that the ladies are coming up with. It's quite addictive and informative and very inspirational, too. I have a million ideas in my head of things to make. Now, if only I could get some of them done! You have been very busy :)love your work!! MAN, have you been productive!! Love all your careful attention to details. You've been doing a "bang up" job, Sooz, and I am so excited to see what else you have up your sleeve. Wow, Wow, Wow!! You have been busy. No wonder you have been neglecting the blog, but it has been well worth it for us to wait. I just love everything that you have been working on. But in particular, I just love the string quilt. I may have to do one like that myself. I hope you don't mind, I just can't stand looking at it and not being able to make one similar. It is just gorgeous! fun little quilts. 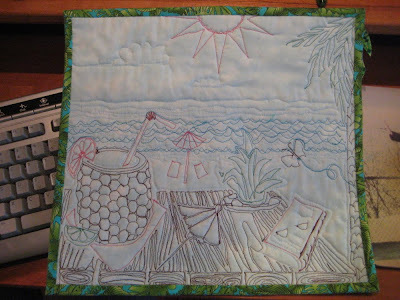 the back of the florida quilt looks great - like a quilt all by itself. oooh, those string blocks really sing. Hello, Nosey Cutie Pie, be good and stay out of trouble. Again ... what an exciting blog! Love the top one and Crazy 9Patch blocks are the best! You've produced some stunning work Susan. Love both the doll quilts. They are beautifully sewn and inspiring. 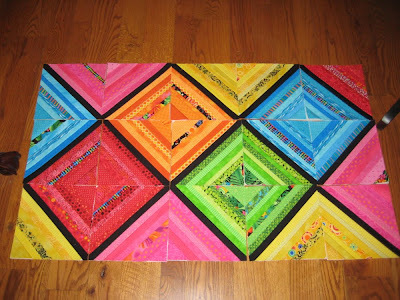 Loving those string blocks, so bright and vibrant. I'm about to use up all those scraps I was sent on my string quilt. Can't wait! WOW Susan, what a lovely work and such a lot of it!! It is a lot to live up to and you are making it much harder for me to start now as surely I can't make anything that beautiful!! OMG!!!! I am in AWE....you do such great work!!! Those string blocks are just fabulous! You have been busy! 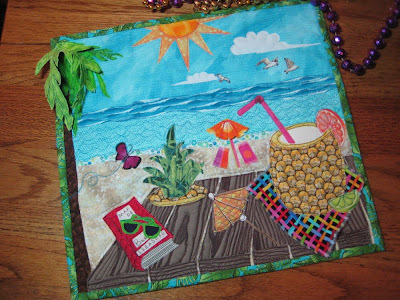 I love the little beach quilt and the back is awesome. I hope you get to keep it after all your hard work. Love the string and 9 patch blocks too. Great to see your great quilts here. I esp love the back of the Florida quilt. I really lost steam too on the circle quilt too - I wanted to do circles, and I was going to do the string blocks using the pork chop swap scraps but it took too long to get the the circles so my interest shifted. The Pork chop swap was the best - thanks again for organizing that. I am putting all the scraps into colour piles and storing them in clear bags. They were great to use in the colour wheel. 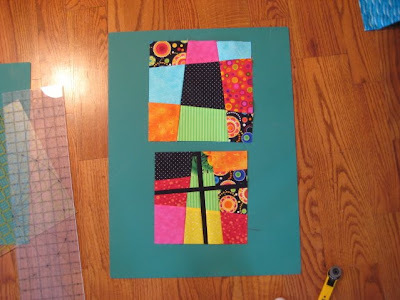 Are you doing the paint box quilt? I am sort of thinking about it. I've answered some of you privately, but if I can't email you, I'll try to answer you here. Karen with an "e"- lol, I'm accumulating the stuff to do the paintbox quilt slowly but surely. I got my bright jelly roll, and have most of the coordinating fabrics, but won't cut them up until I'm ready to start in case I stumble across some better ones to use. I also need a Kona charm pack because I want to make the original sized blocks which use a 3" center piece..... can't do that with a jelly roll strip. I don't know if I'll be able to cut up my string blocks into circle pieces- someone maybe have to hog-tie me and do it for me! lol I got all 25 of them finished and am in love. Thanks for your all the comments, ladies! I really think you are about the most talented person I know! It is such a joy to see the things you make!